PTET 2013 Question Paper with Answers: Rajasthan Pre Teachers Entrance Test (PTET) Exam 2013 is held Today, 5th May 2013 (Saturday) on different centers in Rajasthan. PTET 2013 Cut-off Marks is expected inline with PTET 2012 as paper is neither easy nor too hard. PTET Exam 2013 was held for Admission in 777 Colleges in Rajasthan for B.Ed Academic year 2013-14 for approx. 90000 seats in Rajasthan. Total 2.15 Lakh students applied for PTET 2013 Examination at 538 centers in Rajasthan. 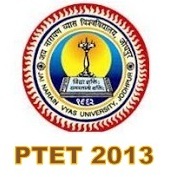 PTET 2013 was held from 2:00 PM to 5:00 PM Today. PTET Exam 2013 question papers contains total 200 Questions, which is divided into Four sections with 50 Questions in each section of paper. Here we try to compile complete Answer Key for PTET Exam 2013 for 200 Questions asked today in PTET Examination 2013 while readers are advised to note that this is not official Answer key as Official PTET 2013 Answer key will be uploaded by JNVU, Jodhpur soon. For time being lets Discuss and find out the Answers of Some of Questions asked in PTET 2013 Question Paper.